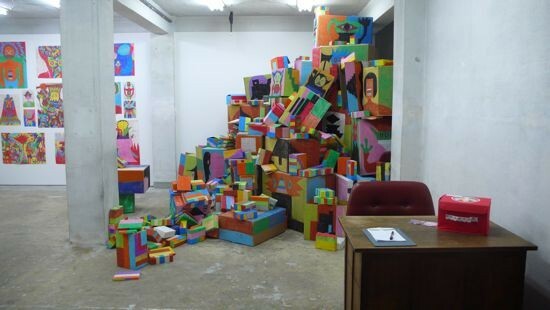 Both: Installation view of “HANAWANDER – Liberation -” at Zenshi, Tokyo, 2011. Photo ART iT. 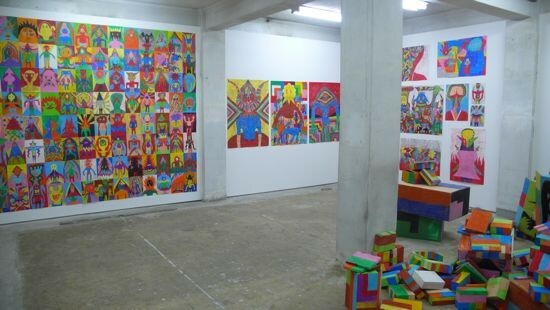 Possessing one of Tokyo’s more characteristic gallery spaces – located in a two-story single-unit building overshadowed by the Kanda area’s drab office high-rises, and with the sliding doors of the ground level exhibition space thrown open to the elements – Zenshi is known for his program of eclectic, outsider-style artists. Closing Feb 19, Masayoshi Hanawa’s solo show “HANAWANDER – Liberation -” is a mesmerizing example of this aesthetic. Hanawa has filled the gallery with works on paper and an installation of various sized and shaped cardboard boxes that spills out from a back corner of the space. Using thickly applied crayon, Hanawa depicts on both the sheets of paper and the boxes different characters from his own cosmology of imagined monsters, which he calls “Hanawanders.” However, combined with the eccentricity of this vision, his eye for detail and complex patterning pushes this project beyond pure illustration – a point reflected not only in the fractal compositions of his drawings but also in the grids and spills of his exhibition layout. Quilted patchworks of primary-colored geometric shapes and astral bends fronted by orange squid-shaped monsters, pink blob-shaped monsters, little-green-man-shaped monsters, child-shaped monsters, elephant-man shaped monsters and even quilted-geometric-pathwork-shaped monsters, these works proliferate infinite variations of form to engagingly mindless effect, much like the votive art of religious traditions ranging from Islamic abstraction to Aztec symbolism and Hindu and Buddhist sculpture and paintings. In Hanawa’s case, the waxy, pastel opacity of this private cosmology approximates the visual equivalent of speaking in tongues, or indeed the monstrous liberation of making sounds without referents.